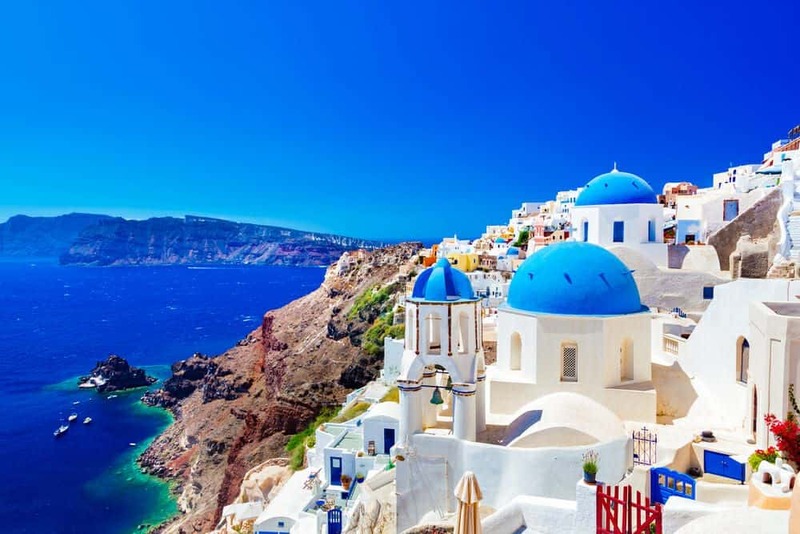 The itinerary has been built with honeymoons in mind by using some of the finest rooms the Greek Islands have to offer, but it’s equally suitable for anyone looking for that extra special romantic getaway. 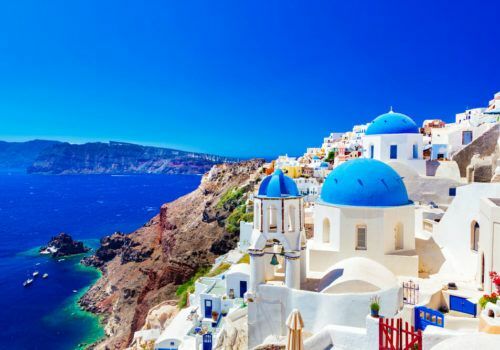 Starting in historical Athens explore the architecture and ruins of the capital city before heading to unwind in the islands of Mykonos, Santorini and lesser-known Naxos. Stay in rooms with their own private plunge pools, in honeymoon villas and enjoy sheer relaxation as you watch beautiful Greek Island sunsets whilst sipping on your favourite drink. All in all, sheer bliss. 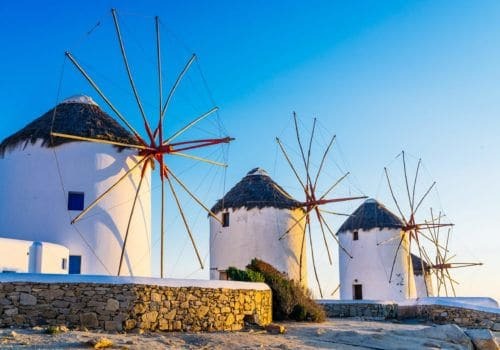 We’ve picked the best gay-friendly hotels in the Greek Islands for this itinerary to ensure you receive a warm welcome. Fly into Athens where you’ll be met by a driver at the airport who will take you to your luxury Athens hotel which will be your base for the first few days. After breakfast at your hotel, you’ll meet your English speaking guide who will take you on a private tour of the highlights of Athens. 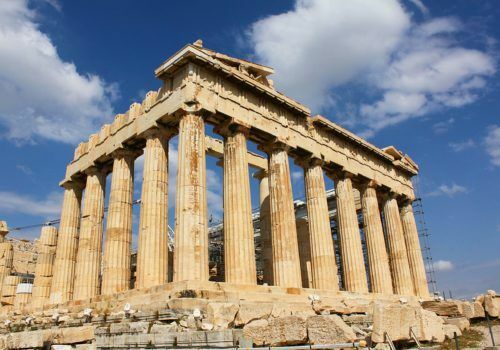 Starting your visit to Panathinaikos Stadium, you’ll also explore the National Garden, Hadrian’s Arch, Greek Parliament and the tomb of the unknown soldier, and then visit the famous Acropolis, undoubtedly the crowning of the beauty and glory of Ancient Athens. Its many monuments include The Propylea, the temple Of Athena, Nike and the Erechtheion, with its Porch of Maidens. Continue with a visit the Acropolis Museum, considered one of the most important archaeological museums in Athens and ranked among the most important museums of the world. The Acropolis includes artifacts from Ancient Greece, statues from the period and caryatids which are sculpted female figures used as architectural support instead of columns. Following breakfast, you’ll check out from your Athens hotel and be driven to Piraeus port for the ferry to Mykonos which takes a few hours. 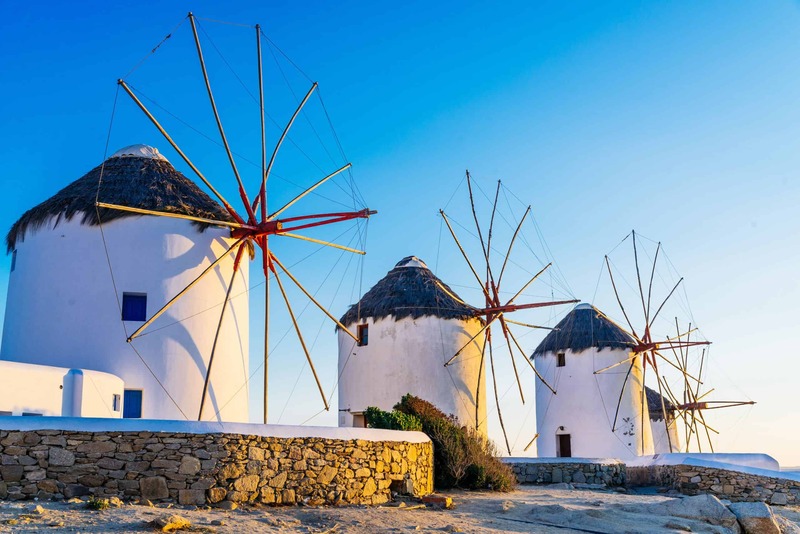 Upon arrival in Mykonos the rest of the day is yours at leisure to explore the cobbled streets of quaint Mykonos town and enjoy the many bars and restaurants the island has to offer. 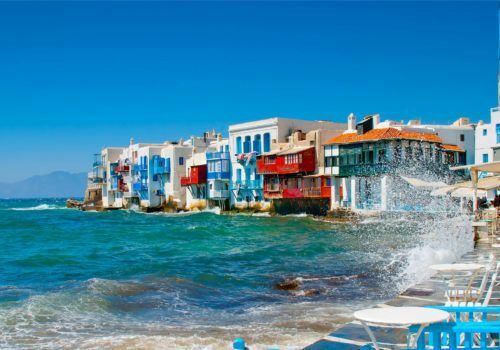 You’ll spend the next three days on the beautiful island relaxing and visiting some of Mykonos Town’s best nightlife, restaurants and gay bars. 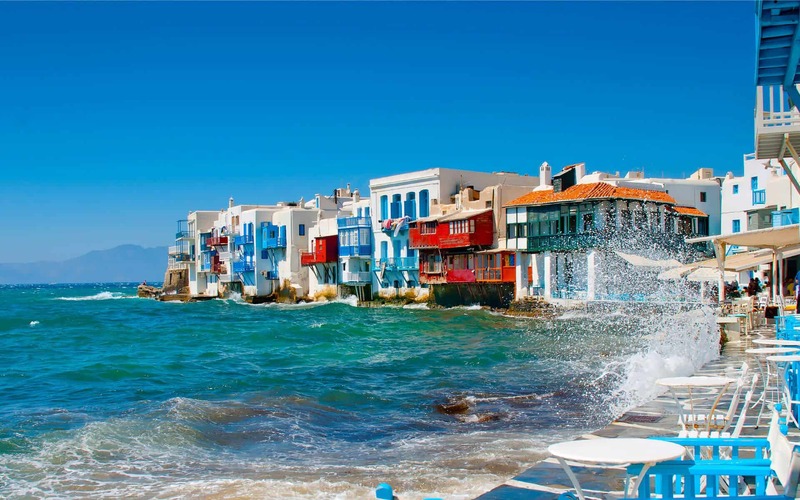 After breakfast at your hotel you’ll check out and be driven to Mykonos port to take a ferry to Santorini. Once you get to Santorini, we’ll take you to the beautiful gay-friendly Canaves Oia Suites Santorini where you’ll have your own Junior Suite with a private plunge pool from where you can watch the beautiful sunset. 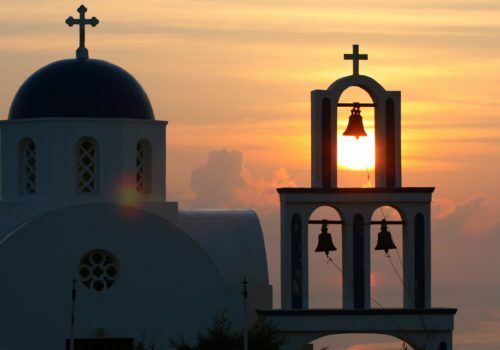 After breakfast, you’ll be driven by to Santorini port to take the ferry to Naxos. A quieter island than the other two, this itinerary will see you stay at the Naxian Collection Naxos in its Honeymoon Villa. 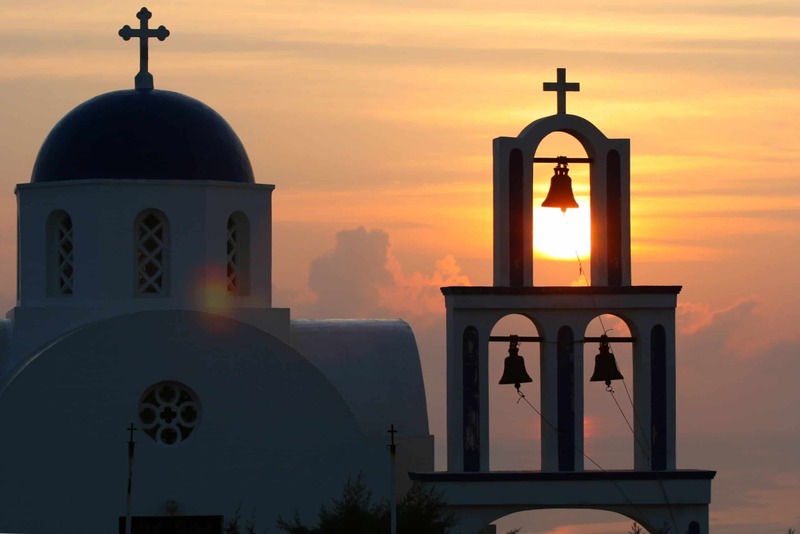 It’s time to bid farewell today and you’ll return to either Santorini or Athens for your onward flight.